A rainy day 2 is a real bummer for trying to get motivated to do…anything. The only good thing rain is for is staying inside and making a warm tasty stew! So what was on the docket? Spanish lentil stew. I’ll admit, this isn’t a first “tri” for me. It is actually one of Steven’s go to recipes that I always look forward to because 1. it is tasty! and 2. I don’t have to make it. In conclusion…you can thank Steven for this tasty recipe! It is super easy and will give you leftovers for days. 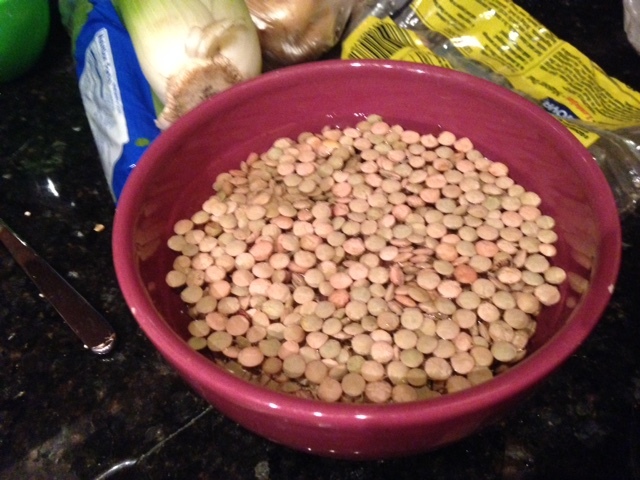 First, get your lentils soaking in water. They say an hour is ideal, but I did 20 minutes because I’m impatient and it worked out fine. Next, you’ll want to prep your veg. The original recipe only called for onions and potatoes, but Steven always throws in some carrots and celery and why not! It is a great way to get more servings of vegetables in. 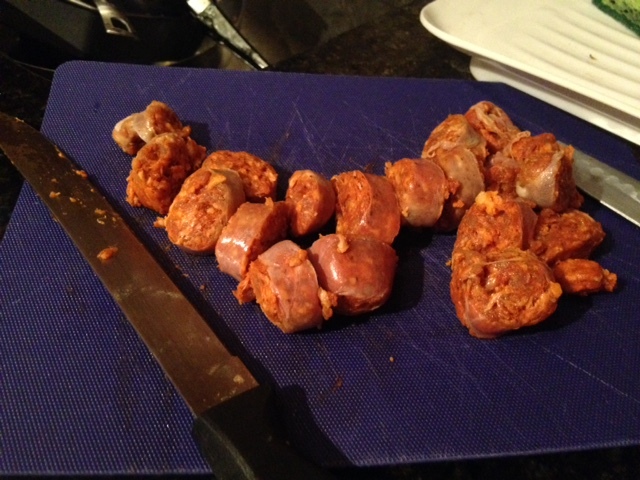 Chop up your chorizo into 1 inch thick slices. I hate cutting meat, freaks me out but I did it for the sake of the stew. Saute your onions and garlic until the onions turn translucent (medium/low heat). Then throw in your lentils, potatoes and 2 cups of water. If you aren’t using extra vegetables, 2 cups of water should hold you over. If you are using vegetables, add them as well with a few more cups of water. Everything does not have to be completely submerged, but enough liquid for it to boil because…..you are going to bring to a boil! Then reduce down to a simmer, add your chorizo and let it simmer covered for 20 minutes and uncovered for 20 minutes, stirring occasionally. and BAM. Stew is done. 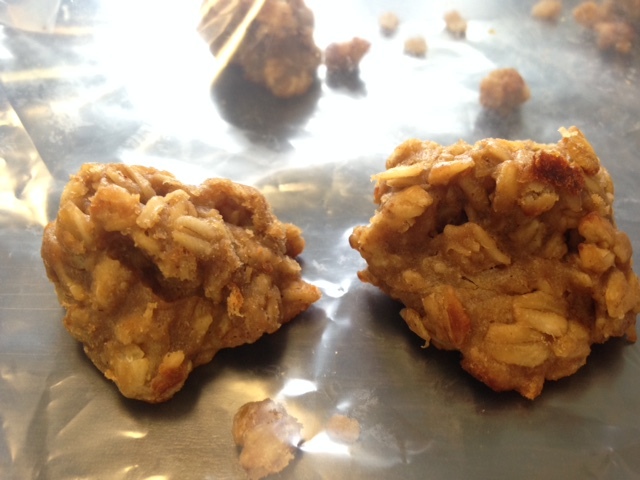 Because I had some extra time to kill and some bananas that were about to take a turn for the worst, I went ahead and made some “oatmeal cookie bites.” Warning, these are NOT oatmeal cookies…not super sweet, not chewy but but they satisfy my sweet tooth, do not involve much work and are semi guilt-free. You can add a tablespoon of sugar if you are into sweet! It’s easy: Mash the banana and stir it in with the peanut butter. Add all the other ingredients and combine. If it seems way too wet to hold form when you put it on the cookie sheet, add some more oats. I used two spoons to make tiny balls on a cookie sheet, threw it in a 350 degree oven for 12 minutes and the finished product…. They are great for a little snack to keep your metabolism rolling through the day! NOW for the Jillian Michaels part. When you aren’t in good habits, your mind can be a really exhausting place. The past 2 days for example my brain went from being motivated, to wanting to do nothing but stay on the couch, to being motivated, to wanting to binge watch “Say Yes to the Dress,” to wanting to make dinner, to then being motivated to work out again….WHEW! See, exhausting. The problem for me is when I eat dinner, the likelihood I’ll work out is usually about 10%; my tummy is full and I’m ready to unwind and watch some TV or take out some bad guys on Call of Duty with Steven. BUT because I am tri-ing to stay with this, I decided to push through. The gym in my building is being redone (and thank goodness…it has CARPET from the 70s and smells like…a gym with carpet from the 70s) so running or lifting is out of the question. Luckily, I have my trusty youtube. I opted to go with “Jillian Michaels 30 day shred.” Its about 25 minutes of work and gives you a good sweat. I’ve done t-25 and its definitely not as exhausting but certainly a bit scarier…Jillian Michales is no joke. Unfortunately, I didn’t have the small weights I needed to complete some of the exercises but my arms so weak right now, cans of stewed tomatoes from my cupboard worked out fine and gave me a real burn. Boy that is sad. Be resourceful! I knew as long as I did SOMETHING i would be better off than I was the day before. Thanks Jillian!